Please see individual varieties for specific product information, but in general the growing information will be the same for all cucumbers. The majority of the information on this page was provided by the University of Arkansas Cooperative Extension Service Cucumber Home Gardening Series; download the complete pdf file with FAQ’s for more information or click here to visit the website. When To Plant: Charley recommends planting your cucumbers in mid-late April after the danger of frost has passed. Planting Tip: You can mulch cucumbers with plastic to warm the soil in early spring or with straw in the heat of summer to keep the soil cool. Preparation and Care: Cucumbers have shallow roots and require lots of water. When preparing your garden soil prior to planting, incorporate compost (optional) and fertilize with a 10-20-10 fertilizer at .4 pounds per 10 feet of row. For fruit development, the flowers must be pollinated, usually by bees. Cucumber flowers are only open for a day. Rainy weather will affect the pollination process due to washing pollen from blooms and the inactivity of bees. 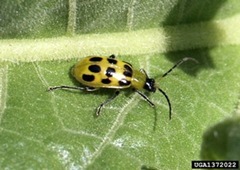 Watch for cucumber beetles from planting to the last harvest. If pesticides are necessary, apply in late afternoon to avoid harming bees and other pollinators. Growing On Vertical Supports: You can train your cucumber vines to grow on trellises, cages and fences to save garden space. This also limits the amount of contact the plants have with soil borne diseases. It may be necessary to tie the vines to the trellis initially or wrap the vines and point them the way you want them to grow. 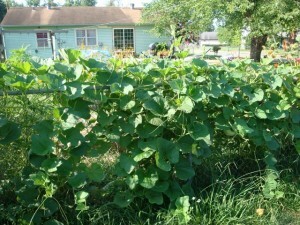 Growing cucumbers in windy areas like western Oklahoma make vertical growing impractical. Fertilize: After you have planted, side-dress your cucumbers when the vines begin to run with an additional .2 pounds per 10 feet of row. You can also side-dress with the Charley Method of a handful toss per 2-3 feet. Side-dress again every 2-3 weeks. Harvesting: You can pick cucumbers at any stage of development. Cucumbers are usually picked and eaten at an immature stage. 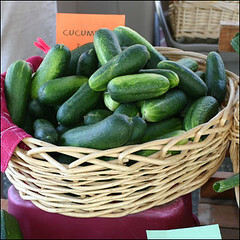 You can pick cucumbers small at 2” or less for pickles, 4-6” for dills and longer for slicing and salads. Pick by turning the pickles parallel to the vine and snapping them loose. Pick cucumbers when the skin is dark green and firm. Large burpless cucumbers should be 1-1.5” wide and less than 10” long. Yellow cucumbers are too old and should be picked and discarded so that more young fruit can develop. Cucumbers develop quickly and should be picked every other day. Tip: To avoid spreading diseases do pick or work in the vines while the foliage is wet.